Now if this isn’t a bowl of autumny goodness, I don’t know what is. It’s actually mind-boggling to me how people (mainly, kids, I guess) don’t like brsusels sprouts. Not only are brussels cute (they look like BABY cabbages!) they carry such a distinct, lovely flavor that absorbs seasonings so well – olive oil, salt and pepper are all you need to transform them. This fall, I’m most excited for brussels sprouts. Hence, this recipe, using another great fall and wintertime veg: butternut squash! 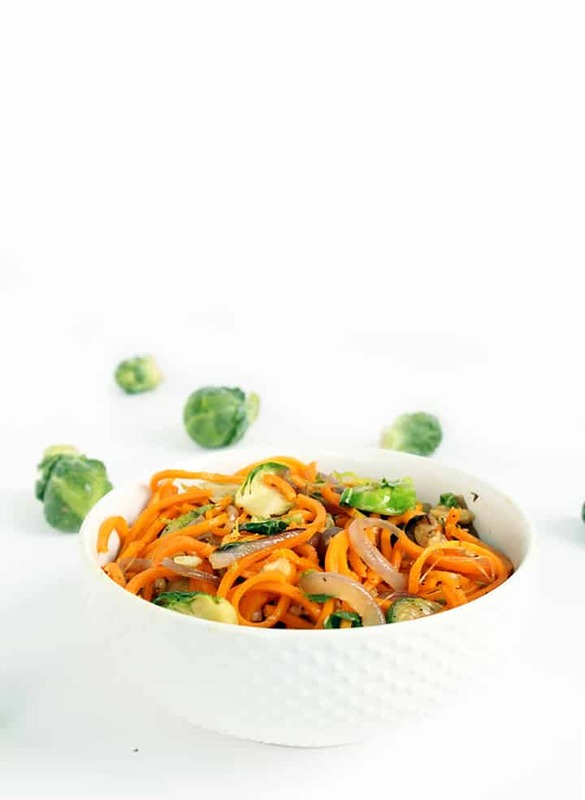 The shredded brussels sprouts add a wonderful texture and flavor to the butternut squash noodles. Since the noodles already have their own wonderful flavor (that’s brought out by the roasting), it only adds to the savory, warm nature of the dish. The walnuts give the dish a lovely crunch – they’re also toasted, which brings out their aromatics and takes away the slight bitterness that you get when eating raw walnuts. What really brings this dish together are the caramelized onions. Their velvety texture adds a soft consistency that makes every bite luxurious. Plus, who doesn’t like caramelized onions? On top of burgers, in salads, in stir fries and now, in this bowl of pasta. Overall, this dish is about as falltime as it gets. Can you tell I’m excited? What are your favorite ways to eat brussels sprouts? Preheat the oven to 400 degrees. Spread the butternut squash noodles out on a baking sheet, drizzle with olive oil and season with garlic powder, salt and pepper. Line another baking tray with parchment paper and place the walnuts. Bake the butternut squash noodles alongside the walnuts, baking the walnuts for just 5 minutes and baking the noodles for 8-10 minutes or until al dente, tossing halfway through. While the butternut squash is baking, shred the brussels sprouts. Chop the bottoms off and peel off the outer leaves, if tough and discolored. Slice them in half and then slice thinly lengthwise. Set aside. Place a large skillet over medium heat and add in the olive oil. Once oil is shimmering, add in the garlic, red pepper flakes and onion and lower heat to medium-low and cook the onion, stirring occasionally, until onion is translucent and mainly wilted, about 3 minutes. Add in the brussels sprouts and season with salt and pepper. Cover and cook the brussels sprouts, still on medium low heat, uncovering occasionally to stir, or until lightly browned and cooked (about 3-5 minutes). Take the skillet off the heat and add the parmesan (if adding) and then fold in the walnuts, stir, and pour into a large mixing bowl along with the butternut squash noodles. I have made sooooo many of your recipes and have recommendced your web site as well as Facebook page to all of my friends. You did not disappoint with this one. Going to try it this week but wondering about shredding the Brussels sprouts, do you mean just de-leave them? They didn't really look shredded in the photo, just leaves pulled apart. Thanks for all your hard work and delicious recipes! There are directions in the recipe! Thanks for the kind words, I'm so happy you've been spreading my Inspiralized page around! I loove brussel sprouts! I usually eat them roasted w/jst a little balsamic glaze & shallots or smthing. But i have the toughest time getting my fiance to eat them so maybe i'll have to try this dish & not tell him they are in there & just see how goes.. :-P The other day i made your Hearty &Healthy Beef Stew over Zuchini noodles but i swapped the beef w/venison (deer) tenderloin & wowza was it super good!! One of the most flavorful dishes i've had in a while! & my fiancee Jason devoured it w/a smile. He wants me to make it again. We love that add a little touch of spice - yum! We eat mostly wild game because its healthier so i'd love to see a few more beef recipes since venison is an easy swap w/it. & maybe a beef/venison with brussel sprouts version & i could really get him to eat them & love them! Haha! Thanks again for all you do! You are amazing at this! Sounds delicious - glad you liked that recipe! Great use of the squash and flavor combos. Question : blade C ? My blades have no letters/distinction, so is that the large noodle maker or the thinner one? Thanks . The blade descriptions are on my How To Spiralize page! Crystal - I can't explain, because they're pictures! It's best people just look at the pictures, it explains everything. When you spiralize the squash do you take the seeds out? or do you just go around them and it works out that they are the core that doesn't go in the pile of noodles? I am new to spiralizing. I made zucchini noodles and they were great. I tried the butternut squash and my spiralizer handle disengaged. 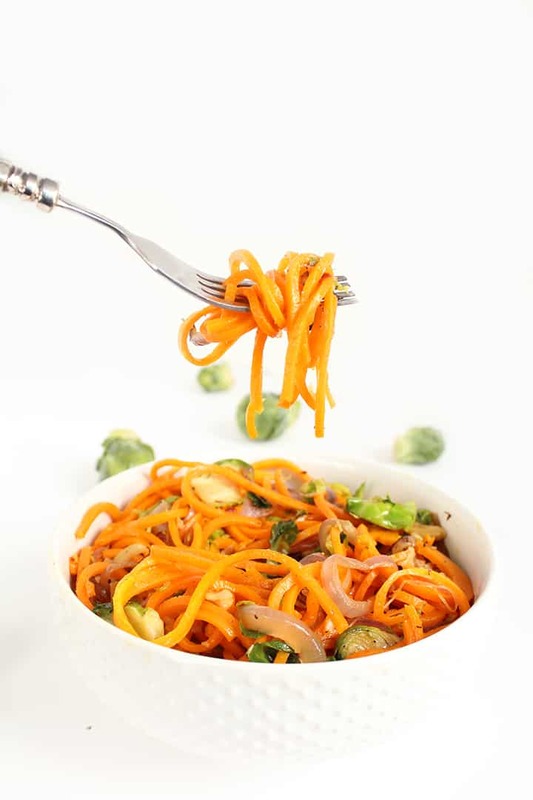 What brand of a spiralizer is strong enough to make butternut squash noodles? The noodles came out more like slices so tightly coiled that they would not separate and then my handle stripped. :-( I ended up making the dish with a vegetable peeler. It was delicious but took me two hours with the peeler! Help! Just made this -- our first spiralized dish -- tonight, and it was delish! So flavorful and a great combination of textures. Thanks so much for your blog -- the whole process gave me a bit of pause before I took the spiralizer out of the box, but your videos and blog made it really easy. Can't wait to try more! Thank you so much - I'm so happy you've found this blog helpful!! I must admit I was a bit skeptical about the whole butternut squash noodle thing, but decided to give it a whirl! Loved all the flavors, Since my absolute favorite way to eat brussel sprouts is roasted with applewood smoked bacon, onion and a hint of garlic, I changed the recipe up just a tad...my wife is now been Spiralized! She no longer misses the pasta (I had to give it up as a type 2 Diabetic)! Luv, Luv, Luv your creativity in this space! One thing that I did notice when spiralizing the squash, is the noodles didn't completely cut thru, You mention this in your recipe, but it seems like extra work at the end. I ended up with more waste after separating, and some sections would not come totally apart. Do you know what causes this? It depends on what kind of spiralizer you have! Which one do you have? I tried to make this for dinner tonight but the squash was too hard to attach to the paderno spiralizer. Any ideas? Perhaps watch my YouTube videos - YouTube.com/GetInspiralized, I have one for butternut squash! I had the same problem spiralizing butternut squash. Knew how to spiralize it and watched your video. I would love to make this work. This is just a thought which i am not sure is the case with what happened to you or not but i used to work parttime at a farmers market & the squash were always tough as nails to cut if they were either not ripe enough or too old & became "fiberous". That may have been part of the problem i am not sure. Or like Ali mentioned not all spiralizers are equally made well. Just trying to help a fellow healthy foodie out. Thanks. I have the Paderno. Squash was picked that day. Perhaps too fresh. I may have found my new favorite page!! This looks amazing!!! I made this for dinner last night and it was even better than I had hoped, thank you! The only problem I had was spiralizing the butternut squash. I couldn't get it to stay attached to either side. I ended up turning it 2-3 times and then re-attaching it. It was so hard the poor teeth couldn't hold it. I'm not sure what I did wrong. If you or your fans have any suggestions, please let me know. We finally got to sit down and enjoy it and will do so again and again. Thanks so much! Butternut squash is my absolute favorite thing to spiral....oh, the flavors!!!! In addition to the olive oil, I tossed the squash with a bit of agave nectar. Making this a main dish tonight, I added a few slices of turkey bacon and some cannellini beans. Nuts...I forgot to add the walnuts...next time for sure. Yummm! 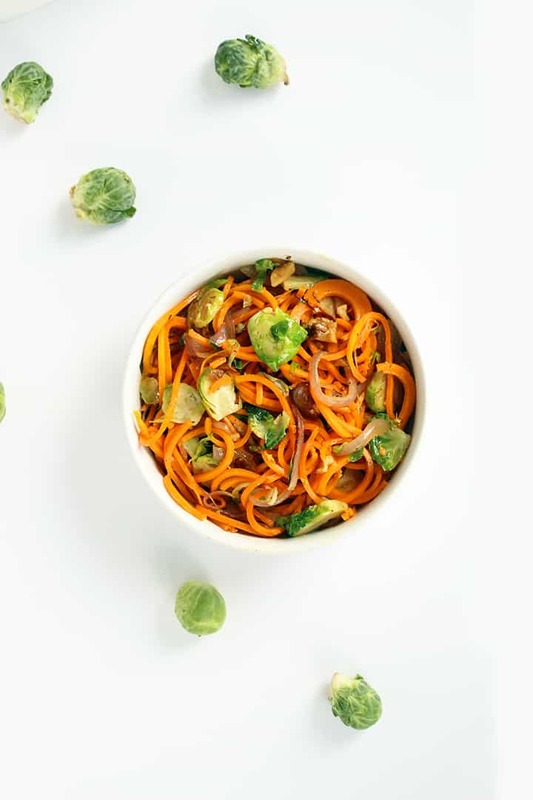 This sounds like fall in a spiralized bowl :) I also <3 brussels, so definitely need to try this! What do you mean #2? I agree ~ Steps 1 and 2 both address how to cook the walnuts, but with different cooking times. I found Step 2 worked better for me in regards to cooking time. This was delicious ~ I love the combination of the butternut squash and the walnuts. I might do a little less onion next time, but that is just personal preference. Thank you so much for your awesome work every day!!! This was crazy yummy! Loved the roasted butternut squash spirals. I added a splash of juniper berry infused balsamic vinegar to the Brussels sprouts at the very end of the cooking time. I'm so frustrated! The first two times I spiralized a butternut it worked great. Every time since then they won't properly separate into noodles. It's one wide noodle scored with lines. I've tried everything...help!! Made this tonight. So tasty! Next time going to try it with my new pumpkin spice olive oil and maybe some crumbled bacon. First time to spiralize butternut squash and love how that turned out. Thanks for the recipe! I'm new to your blog and was thrilled to, at last, find a recipe that DOESN'T use zucchini. I do like zucchini but I was beginning to think it was the only vegetable one could use the spiralizer for. It seems 99% of all recipes are for zucchini this and zucchini that. Such zucchini overkill. I'd love to see some beet and other veggie recipes and I'm so glad to have found you. Oh ... any opinion on whether the 3-blade or 4-blade Paderno would be more versatile? Thanks. I made this last night as a side dish to spicy salmon and it was divine! All of the flavors worked together beautifully, especially the crunch of the toasted walnuts. I'll definitely make this one again. Thanks, Ali! Wow, this was awesome! If you really let the onions caramelize and then saute the butternut squash to get some color on them, it takes the recipe over the top. I also threw in some kale at the end for some greens. This even tastes delicious reheated for lunch the next day! I never post, but just had to say what a huge fan I am of you, Ali, and of Inspiralized! Got all my co-workers hooked as well. Thanks for all you do! Great tip - and thank you for Inspiralizing your coworkers! You've marked the video here as "private," so we can't watch it. Hi Ali I've just made this dish for Dinner with some chicken breast. It's absolutely delicious!! I'm new to Spiralizing but I'll definitely be trying some of your other dishes. Thank You! Oh my word!!! This was amazing!!! I changed a few things tho, I used coconut oil and did not toast the nuts. Talk about full flavor deliciousness!!! It was worth every tear shed cutting those purple onions. I looked like someone shot my beloved dog...mascara running down my face, bloodshot eyes; I was a mess. You just made my day!! You're my new hero. YES, so glad you enjoyed it! This is my absolute favorite recipe. 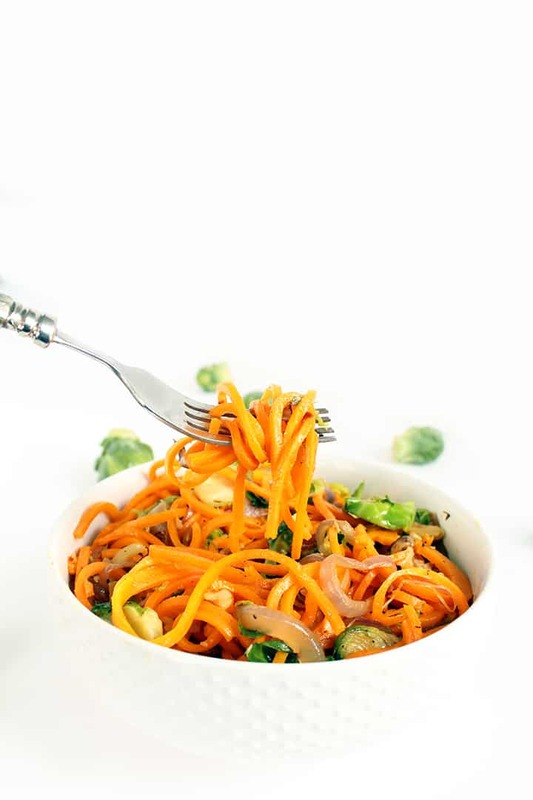 I have had so much trouble with spiralizing the squash, so make this with sweet potato noodles and I love it! I added a little bacon to the brussles and it was amazing! First off I would like to say terrific blog! I had a quick question that I'd like to ask if you don't mind. I was interested to know how you center yourself and clear your thoughts before writing. I've had difficulty clearing my thoughts in getting my ideas out. I do enjoy writing but it just seems like the first 10 to 15 minutes are usually wasted just trying to figure out how to begin. Any recommendations or hints? Appreciate it!